Posted on April 12, 2015 by revivewa	in Travel and Spirituality and tagged 1, faith for every day, feature. “You asked about how to approach Aboriginal people,” Aunty Denise Champion picks up our conversation from several days ago. “This is how,” she says as together we step onto a path leading to a low circular monument. 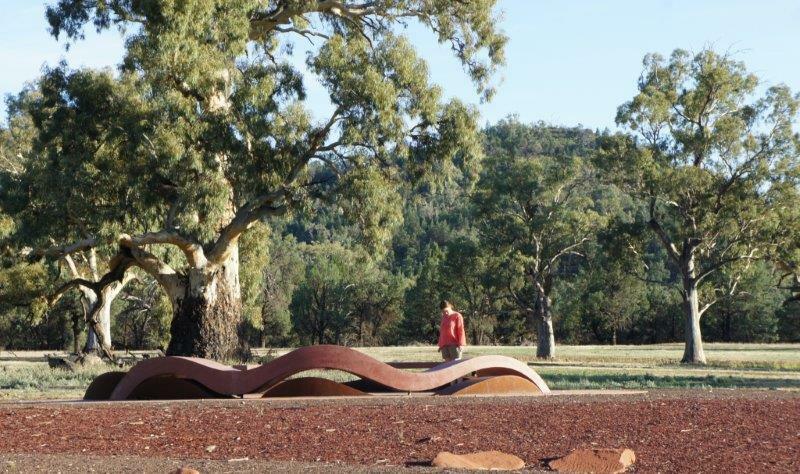 Nothing would have kept me from walking directly to the sinuous rust stone carving that mimicked the two snakes of Ikara (Wilpena Pound), the vast geological monument that surrounds us. There were no barriers, no instructions, no protocols, just a stone marker at the mouth of the path announcing, “Ngarlparlaru yata”. “This is our country,” Denise translates as we walk the two-toned gravel walk that wound its way to the centre. In the Aboriginal world, nothing is direct, the subtleties confound. Embedded on the ground are crosses, horseshoes, and a length of barbed wire that cuts across. Even for me, it is painful, the line between prison and freedom. For all the Adnyamathanha place names that Aunty Denise had earlier asked us to remember – Vandha Urthanha, Yura Bila, Ngurri Madlanha – she gives us no name for this memorial. She refers to it as the ‘National Park Rangers Quarters’ – in English, as is ‘Colebrook Home,’ the second home to Aboriginal children stolen from their families, 800kms north of here. Aunty Denise, a Uniting Aboriginal and Islander Christian Congress elder, is leading a pilgrimage of about 30 persons on Adnyamathanha country, 430kms north of Adelaide. There are whitefellas and blackfellas, but when one looks closely, the lines blur. There is Rhanee whose mother is Aboriginal and whose father came from Indian, Malay and Anglo lines. With her is her American-born husband, who traces his genealogy to Costa Rica and to Africans who were taken there. Their children are dusky blonde beauties. There are the three brothers from the Taize Community, one French, another German, another Australian, their own ‘Pilgrimage of Trust’ intersecting with us: Anglo-Australian, German-Australian, Italian, French, Liberian and Filipino. “Anhangha idla ngukanandhakai,” Aunty Denise recalls her father saying, I am going back to this place now. “Wanangha nai?” And where are you going, her mother would respond, as she must to keep the story alive. “I am going to a special place in my mind,” her dad would say and together they converse about a special time and place, weaving new aspects to the story as they tell it to their children. Thus the Pilgrimage is also for Adnyamathanha elders, Aunties Denise, Pauline and Noeleen so they could take their daughters and grandchildren on country too. They now live in the settlements of Hawker or Port Augusta. Rangers have fenced out sacred rocks for health and safety reasons. As we travel through country, the aunties will not let us have paper and pencil to write on. Look, listen, they instruct. It could be a matter of life or death. They take turns telling creation stories and naming plants and their nutritive and medical properties. They ask us to say the names after them and leave blanks in the stories for us to fill out. One is about Aldyanada, the Barking Lizard, and Adnu, the Bearded Dragon and why the sun rises in the east, told just as the sun is rising. The stories are written on the land and in memory. It is on country where the stories become alive. They are stories of orientation without which one is lost, stories of accountability and co-operation. For them to live on, they need to be retold afresh, like winter floods washing the roots of trees in the dry creek beds. Aunty Denise has broken with tradition and has written a paper and ink book with colour photographs. In it her people’s stories become parables of a faithful God who searches for lost children. They are stories of vulnerability and hospitality on land that is a sacred storybook and where if one listens deeply, there might be no need for questions.